There were in fact a number of farms called Potlocks at one time in the village. Two were demolished to build the Power Station and another still stands on the south bank of the canal, near Canal Turn, but is now in Findern parish. 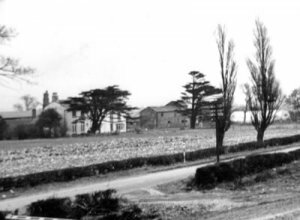 Along Twyford Road towards Frisoms Lane, was Potlock House Farm. This was notable amongst other things for having three very ancient cedar trees in its grounds, two of which still survive and are well over 500 years old. Potlock House was a pretty Georgian House built on the site of what was the seat of Geoffrey De Potlock, in about 1130AD. He was an ancestor of the Tokes. The estate passed to the Harpur's and was the home of John, second son of Godfrey Thacker, of Repton 1660-80. The original house was demolished in 1805 by John Glover who replaced it with this attractive Georgian House, surrounded with farm buildings and with its own wind pump. Despite a public enquiry in 1983, and much local opposition, permission was given to demolish the listed building in order that gravel extraction could be undertaken. No such extraction has started in 2011.